Kiki Shakti meets up with Stephen Plyler, partner and DJ at KNCE 93.5 and one of the organizers of the Music on the Mesa festival, this May 29th, 30th, and 31st at Taos Mesa Brewing. FIND THE FULL MUSIC ON THE MESA SCHEDULE HERE! 1. What is the Music on the Mesa FESTIVAL all about? When we moved to Taos, I got involved in the radio station and one of the first things I thought I would do here is create a festival. I grew up going to Austin a lot and I went to school at North Texas, a music school. I’ve been around the music scene for a long time. My parents did festivals. My dad was a guitar player and wrote bluegrass music and we used to go to bluegrass festivals all summer long, every week. So, I kind of have that festival thing in me. When I got here I started seeing some similarities between Taos and Austin. I always thought that. I’ve moved between Taos and Austin a couple of times. There’s a reason I like both of those towns. So, I thought that there is a real chance for the music scene here to explode. And the fact that people want to come here. I quickly figured that out when I moved here — I have a little guest apartment and every weekend it was full with my friends from Texas. I thought, if people want to come here, I bet you artists want to come here, too. So, I approached Taos Mesa Brewing and they were 100% on board – refreshingly so–– “let’s make it happen, do it.” And, so that’s kind of how the thing here started. I think there’s really an opportunity to do big things here. That’s really how the music on the Mesa festival came about. I thought that I could do a festival –– a little festival is what we discussed. At first, it was just going to be just some artists that I knew. It was going to be small and we were going to keep it small. And then we started getting inquiries from bands wanting to play. At first they were smaller bands, and then, I don’t know, I guess people talk, because next thing you know bigger, more well-known bands started e-mailing us that they would like to take part in Music on the Mesa. So we had to make a decision, how big were we going to go, and we just decided to go all the way. So, we grew the festival. 2. Big bands such as? Turnpike Troubadours and Justin Townes Earle. The Revivalists, a huge band out of New Orleans. Jamestown Revival was probably on every Top 10 list of albums last year. Those are pretty much our headliners and a lot of them initiated conversation with us. We grew the festival very quickly and the common theme was that people wanted to come to Taos. In fact, Justin Townes Earle’s agent said that Taos is Justin’s favorite place in the entire world. Good! Because it’s my favorite place too. Mine too! We looked at it as a way to share Taos with people. We hope locals will come out and support, because it’s a really cool thing for Taos. And it’s a thing that’s going to grow. This is the first annual, so next year will be even bigger and better. 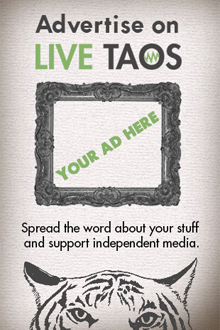 We want Taos to be represented well, but we also want to bring revenue to Taos. We’re going to fill the hotels. 3. I was wondering about that, even just bands. There are a lot of bands on the ticket. Where are you housing them? We are filling up at least one hotel with just bands. And, we are expecting a lot of people. We have targeted outside of Taos; we’ve targeted Santa Fe, Albuquerque, Texas, Colorado. We have people coming from all over. Turnpike Troubadours is a regional superband in the Southwest region, like New Mexico, Texas, Oklahoma, Colorado. They are the highest-booking band in the Southwest. They cross cultural barriers. They’re very popular in the Hispanic community, they’re popular in the cowboy community, they’re very popular in the alt rock community. They’re these boys out of Oklahoma, they are great writers and it just kind of exploded. And they turned into this otherworldly act that has its own little cult following in the Southwest. Everywhere they go they just sell out venues because they’ve been known to give such electric performances. 4. What is the major or connecting theme between all these musicians? The music definitely falls more in the Americana genre. Americana music is a fusion of country, blues, soul, bluegrass and folk, rooted in American music. That covers so much ground — Mavis Staples is Americana. BB King would be considered an Americana artist. Steve Earle is an Americana artist, by the same token Turnpike Troubadours is an Americana artist. And now, a lot of old country artists who used to be considered country are now considered Americana artists. Honestly, it’s a catchall term, because it captures a lot of music that maybe doesn’t have a home… or, America is its home. Roots of American music. That’s what makes it a really appealing thing to get into and embrace, because it embraces a lot of things. It’s not a limiting music genre. It appeals to a lot of people from young ages to old ages and different ethnic groups and everyone in between – it’s an inclusive music. 5. Taos is so diverse and we are like our own tiny little melting pot, with a creative bent with so many artists and musicians and poets and artisan whatevers. I do agree with you that there is so much potential in this town for it to become a music Mecca. How will this festival contribute to that? Well, number one, it’s the largest festival that’s been in Taos. Solarfest by far has more experience, and they get big names and they’re spectacular. But this is 25 bands — as far as I know 25 bands has not been done in Taos. It adds the maximum access to music that Taos has possibly ever had, as far as different acts over 3 full days. I would be happy to do events in the park also, but there’s a part of Taos that‘s not the park – there’s a part of Taos that is the Mesa. That’s a very significant part of the Taos landscape. I mean we’re limited [in town]. You can have a lot of people in that park, but out there… it’s vast. There’ll be people camping in the Rio Grande National Monument, walking over to the festival. I envision something that can only be done in the wide-open spaces of Taos and the Mesa Brewing captures that. You can’t sit out at Taos Mesa Brewing amphitheater and look at the mountains and not envision some kind of frontier. I envision it growing into something where you’ll be driving down there and you’ll see cars just all along the highway and people carrying their lawn chairs — like Taos’ own little Woodstock. The mud of Woodstock, also possible. Hahaha! We hope not, but it is possible. But you know that’s what’s great about music festivals. That’s what’s great about the mesa, is that it’s unpredictable. Yes, it’s unpredictable. Be prepared for anything. That’s what’s great about Taos Mesa Brewing, is that they are so on it. They’ve finished the outside. They’ve put in new rock and crushed gravel. So there’s some mud awareness. There won’t be mud inside the brewery and the amphitheater grounds. Outside, in the parking lot? There might be some mud. Inside there won’t be mud. I cringed the first time I thought about the possibility that we might have a rain event, and then I thought, this is Taos. If we have a rain event it’s going to make it more memorable. When I was involved in the music festivals in Pagosa the best festival I remember was a rain fest. It was magical. I was watching a band called The Lone Bellow and they were performing this particular song. In it they were talking about, “And lightning strikes…” If you’ve never seen The Lone Bellow, they’re from a folk rock band from New York, and they’re kind of dramatic, and the singer is very emotional, he is just one of those people who emotes when he sings, you can feel it viscerally. So, he’s up there and he has his hands up into the air and he goes, “And lightning strikes…” and lightning strikes at the exact same time. I mean he starts crying and can barely get through the song; it was the most spiritual experience. It was magical. The whole crowd just erupted. The set was just extraordinary after that. 6. Whether it gets rains and gets muddy, or not, there is a camaraderie between all these different people attending a festival. Like Taos, we all have some camaraderie about living here, right? Like, “It’s windy in the springtime. Well, that’s just Taos.” We do require a tourist economy and we do need the influx of outside money. I like the idea that this festival is fostering camaraderie in the community. One of my goals, when I first started having artists here, was that I wanted them to appreciate Taos as much as I appreciate Taos. And that’s easy to do, but that’s been a goal all along. So, we picked artists who wanted to come to Taos, and we picked artists that would stick around too. There’s going to be camaraderie between them, too. And that’s what you want at a festival. I want to see artists coming out into the crowd. I like that. I like the idea of that we’re-all-in-this-together thing. Willie Nelson. That’s what happens when you grow something. I was asked the other day, what my goal is and if I would be dissatisfied if we only got 500 people. I said I really want more than 500 people to come, but if every single one of those 500 people says they had an incredible experience, and they want to come back next year and they tell all their friends how incredible it was and how unique the experience was, I‘ll be completely happy. So, that’s kind of how I’m looking at it. Obviously, I’d love to have 2,000 people there. I’d love to see people poking their heads over the fence and trying to get a view because they can’t get in. It’s going to be that good of a show. 7. How mANY PEOPLE will the venue hold? The max is 2,000 and we have parking for that. You can fit 600 in the parking at TMB, but they have 5 cleared acres next it. Last year when Los Lobos was here, there was an estimated 1,200 in attendance and we didn’t even come close to filling up the 5 acres. So, 2,000 can be done pretty easily. Also, for the rain thing, we’re putting up two big tents so there will be protected space and you’ll still be able to see the stage from there. 8. And you’ll still be able to see the sunset? Ummm, yes, you will be able to still see the sunset. Also, you’ll get the reflection of the sunset on the mountains, which is always spectacular. Last year when Susie Bogguss was here, she was just mesmerized by it. We were looking at the sunset and she was taking pictures, you know, selfies. She turned around to get a selfie of the sunset and she saw the light on the mountain and she was just in awe of how equally spectacular that view of the mountain is to the sunset. 9. 25 bands is a lot. TMB is a big and beautiful venue, but logistically how is this going to work? He turns to the computer and looks up a Grace Askew song. She’s remarkable. I interviewed her a while back, when she was in town. She used to live in Chama, back in the day. I think the winters in Chama were pretty hard to handle. She loves Taos, but she said that she didn’t know if she could ever move back to New Mexico after her time in Chama. There are a lot of artists there like her that you’ve just got to see. Everybody’s going to be there for Turnpike or Justin or whatever. But there’s Grace Askew, there’s Sammy Brue — he’s 14 now. He’s on the cover of Justin Townes Earle’s Single Mother album. Rolling Stone just did a big expo on him as the next big thing. I wouldn’t say he’s all the way there yet, but what he’s writing about is very… he’s big on Twitter, and he went on to Twitter and asked for people to share their stories about suicide because he wanted to write a song about it and didn’t personally know anyone who had committed suicide. But it was important to him, because he was a nerd and music was what saved him. He was bullied, and then he picked up the guitar. He’s a savant, he started playing at 12 and by 13 he was already getting gigs and opening for big names. Music saved his life. That’s a very powerful thing and when he sings, you get that. You get it. And that’s what’s really special. This kid is going to one day be playing stadiums and it’ll be $100 a ticket to see him and you saw him at Music on the Mesa in Taos, NM. He just got a major record deal, so some of his earlier recordings are a little rough – just him sitting with a guitar. He begins to play a Sammy Brue song, “I Don’t Want You to Leave”. Right now he’s kind of the king of the ballads. He’s so freaking deep for a… human, not just for a 14-year-old. Another artist that people just have to see is Robyn Ludwick. She also writes about some really deep heavy stuff. I mean, if you listen to her music, you’ll just be dancing and head bobbing along. But if you pay attention to her lyrics, it’s intense heavy stuff. That’s the kind of songwriting I like. It’s honest and it’s about people. That’s what I like about these artists — they write about real things and real tales. You know, you think about David Bowie and bands like the Rolling Stones or the Beatles or any variety of many other bands, there’s a reason people love the Beatles, or whoever is that there is an honesty. No matter how imaginary the setting, it’s not just bubbles and frou-frou. Honesty makes great music and it seems to me that a lot of these musicians playing at the Music on the Mesa festival are coming from a real honest, soulful place and that we’ll be able to come and witness that and partake in that to have our own soulful experience. That’s why I think this is a great thing for Taos, because people’s minds in Taos are capable of absorbing all that. You know what I’m saying? To welcome it — you have to welcome that soulful experience into you. Taos is a place that welcomes that. We’re able to think and feel outside of just the notes. 10. Tell me about your radio show on KNCE. What’s it all about? What time? I do two shows. I do a Roots Country show on Wednesdays from 10am -1pm. And that’s not your typical country show. It’s an educational country show. Like, one week I did the roots of rockabilly and I took you from the early beginnings of rockabilly. I had an Appalachian music week — I played a bunch of old Appalachian artists, like sitting on their front porch. I research all of this and I give you information about the artists and about the music and why it’s important and what it influenced. I almost hate to use the word country, because people pigeonhole that. The roots of country music helped shape a lot of things in modern rock music and in folk and in blues. And then, my Saturday show is my Americana show — three hours of Americana. I’ve been focusing a bit on the Music on the Mesa artists because they are coming and they are relevant. Last week I did two hours of nothing but brand-new music — debut music. Stuff people might not know about yet. Things that are current on the Americana charts and things that I dig. 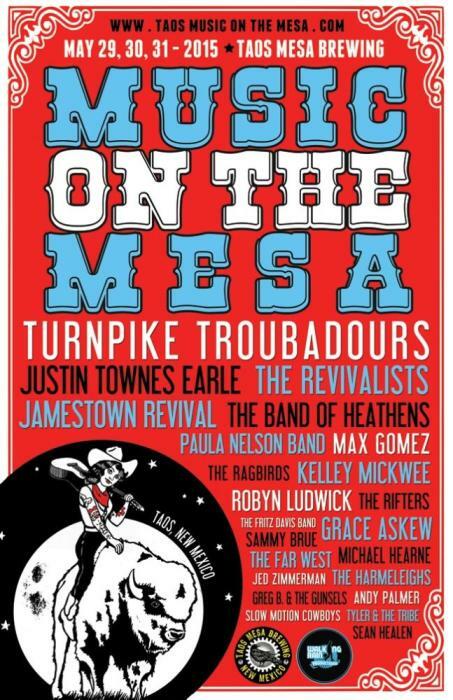 Just listen to the show and you’ll know how good the music will be at Music on the Mesa festival. Come in with no preconceptions and turn on the radio or stream it — just listen and then make your judgment. I think you may be surprised what’s in it. I tag all the artists that I play on the show and then some of them share “listen to TrueTaosRadio.com.” So now people are streaming it and listening to the show. People are streaming it from Michigan, from Texas, from Tennessee, England – from wherever. We got second-best radio station in Taos for 2014 — we only had the last three months of 2014 [on the air] and we came in second place, which is awesome. Do I want to be second? Never! But the fact that it’s a brand-new station going against more well-known stations that have been around for a long time, it’s just the most awesome thing. 11. I think a big part of that too is that the people like you and I who are doing shows on KNCE, are just passionate about the music and really just want to disseminate information about the music. That’s why I think this festival is going to be a success: because it comes from a place of passion about music, and to me, that’s what makes something great. That’s what makes our radio station great. That’s what makes our DJs great. Because, the DJs aren’t doing it for money. They’re doing it because they love the music they’re playing. And that makes all the difference in the world. If I don’t love the music, then I’m nothing more than a cheap used car salesman and I’m not going to be a cheap car salesman. I’ve got to love what I’m producing. If nobody shows up, and I love every single act I put on stage, then I did my best and that’s okay. Because at least I put a product out there that I love. I think a lot of people would say, “Well, who could get you the most people there?” Yes, we have some big acts, no doubt, but we got big acts with integrity that we think make great music. That was our barometer from the beginning: do they make great music? The First Annual Music on the Mesa Festival!